(Phys.org)—The science journal Nature has published its latest "Salary and Satisfaction Survey" where they show the results of polls taken of researchers from academia and industry the world over to see how they are feeling about their jobs, pay, funding, job security, etc. and overall it appears the majority are reasonably happy with what they are doing, though many are nervous about the future due to tight budgets and a tougher grant process especially in those countries hardest hit by the rough economy. The survey also found that overall, pay for scientists has grown stagnant compared to 2010, when the journal undertook its last survey. In all more than 11,500 people who work in various science fields in universities and with companies that perform research of one kind or another responded to the survey and they came from over a hundred different countries with very large sample sizes from more than a dozen. Their answers have been compiled into a series of charts and graphs with commentary from various authors regarding what it all means. Among other things, the survey showed that geography matters; scientists working in many of the Nordic countries for example showed some of the highest levels of satisfaction with their jobs, while those in Japan, China and India showed some of the lowest; the US came in near the middle of the pack. Not surprisingly, respondents answers reflected the current economic states of the countries where they work; scientists working in Spain and Italy, for example, were more nervous about their careers than were those in the Denmark, Sweden and Switzerland where the economy is doing well, while many in the US were worried about the tightening up of grant money and the extra amount of work it took to receive funding. 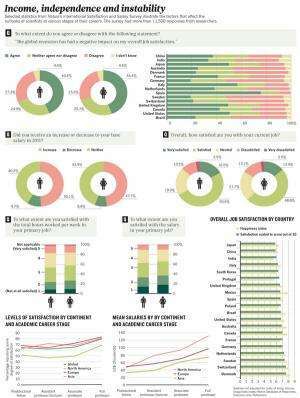 One area of the survey that stood out was the happiness level of scientists who were allowed the freedom to work in areas they wanted, most were quite happy, though there were some exceptions, such as China and India, though both represented the most growth from the last survey. There appeared to be huge differences in how people felt about mentoring programs though, with high levels of satisfaction reported on average, but very low levels reported in some countries such as China and India. Not surprisingly, respondents were mostly happy with their amount of pay, though women still earn on average twenty five percent less than their male colleagues, they too reported feeling mostly positive about their jobs in general and in how much they earned. When asked about the impact of pay on overall happiness with their job, most seemed to feel that what they did mattered more than how much they were paid for it, so long as they made a reasonable amount doing so and suggested that things would be great if the economy would pick up. Because most anyone in the sciences knows that they can get way better paying jobs in the industry if they want to without too much effort. It's a conscious/personality based choice to go into science - not an economic one.